Forrest General Healthcare Foundation and Forrest General Hospital hosted a Groundbreaking Ceremony for the Becky and Bill Oliver Healing Garden on Tuesday, October 30, at 10 a.m.
“I know The Becky and Bill Oliver Healing Garden will provide so much comfort to our patients and their families for many years to come. It is very aptly named for the Olivers. 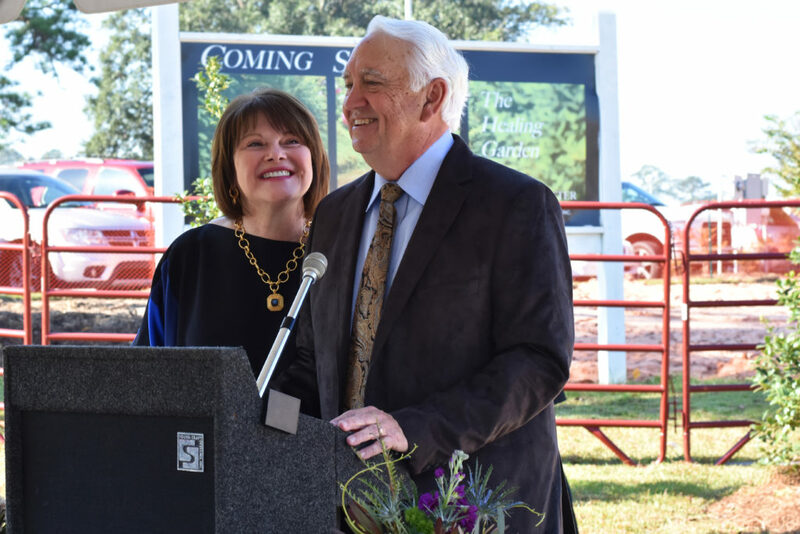 I cannot think of a better tribute to them and their vast contributions, nor is there anyone better to represent the Healing Garden and what we hope it will be for our community,” said Martha Dearman, executive director, Forrest General Healthcare Foundation. The Becky and Bill Oliver Healing Garden at Forrest General’s Cancer Center will offer patients, loved ones and visitors a quiet, outdoor space away from treatment areas. The garden will be open to all, every day from dawn to dusk. Its purpose is to help reduce the stresses of illness and hospitalization by encouraging calm, comfort, and relaxation. The garden is part of a Forrest General Healthcare Foundation project called Together We Can…Advancing Cancer Care. The project also included the renovations at the Cancer Center to create the new infusion center and family waiting area and to introduce the Patient Navigation Services Program. For more information about Forrest General’s Cancer Center, visit forrestgeneral.com/cancer. CAPTION: Becky and Bill Oliver speaking at the Groundbreaking Ceremony. CAPTION: Becky and Bill Oliver, center, surrounded by members of the Forrest General Healthcare Foundation board and supporters.